Wallflower Wish List: Bring on the Spring!!! Alright, it has been WAY too long since I posted. I have now learned my lesson that taking six university courses in one term is just overkill and doesn’t leave much time for blogging, or for anything else really. But to kick off 2015, I wanted to do a wish list post about new items that I am just dying to purchase and wear for spring given it’s been raining for weeks straight in my little city. I hope you enjoy!!! 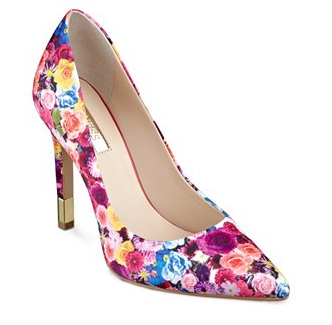 Spring is the perfect season for little white dresses, and what better way to add a little colour than with floral pumps like these??? I just think these are so adorable, and they could be worn casually with a white lace dress out for lunch, or they could dress up a classic little black dress to make any evening wear a little bit more fun. These shoes may be outside of the footwear budget for some, but signing up for Guess’ email list means free shipping and an extra 15% off!!! ; definitely worth it. Also, for a limited time, Guess has duty-free shopping and free shipping on orders of $125+. Another super cute Guess find that I came across while scooping up some unbelievably good deals online last week (expect a post about that) was this little black and white polka-dot dress. 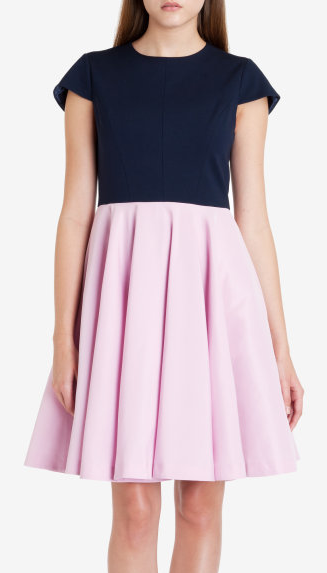 Made of chiffon with a fit-and-flare silhouette, I fell in love, as this is my default dress style. This dress, like the pumps above, has the potential to be the centerpiece of either a day or night look: toss on a little black shrug and some flats and bam, you’re ready for a day out, or slip into some black heels and grab a clutch and enjoy your night out. In case you haven’t noticed by now, I really, really, really (picked up on the emphasis yet?) like my florals. Like love. I know no limits. I’ll even take grandma florals. 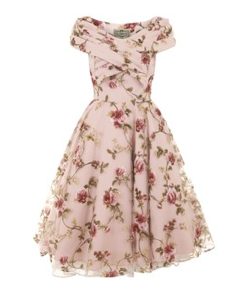 Anywho, while I won’t be adding this dress to my floral collection (bit of a hefty price tag for me), I just had to include it in this post, because it is so fresh and springy, and I think it would be perfect for an afternoon tea out on a patio overlooking sprawling green hills and a lake in the distance . . . ok, so maybe I have a few fantasies, but you can’t deny that this dress would look mighty fine on that patio with some pink pumps perfectly crossed under the table. I may have included this Ted Baker number in another wish list post, but I saw it online and knew it had to be brought up again. Colour-block dresses are so fresh and, once again, go anywhere. Basically that is what I look for in a dress. If I’m not shopping for a dress for a specific occasion (dinner party, graduation, wedding) then I want it to be versatile and be able to go anywhere. Dresses with a full skirt like this one are super comfortable, and the skirt makes them look a little dressy (no pun intended) so they can be paired with any footwear and be worn to a multitude of places. What I really like about this dress in particular is the exposed zip fastening on the back, which unfortunately cannot be seen in this picture but, trust me, it’s there. This dress will be a new addition to my spring wardrobe soon enough!!! Alright so this dress is from a store called Garage that, if my memory serves me correctly, only exists in Canada. 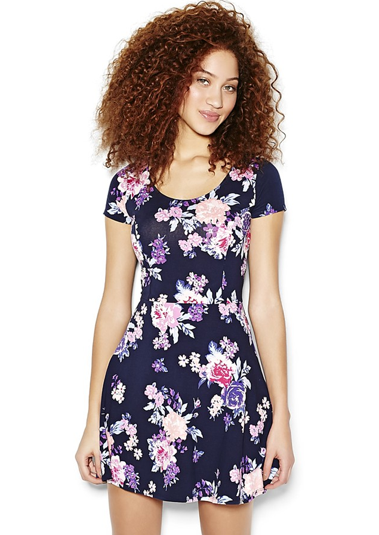 It has some really cool clothes, and has just brought in some of its spring stuff, like this dress here. Though it isn’t visible in the picture, since I wanted to show off the front of the dress more than the back, it has two cutouts: one horizontally across the shoulder blades, and the other horizontally across the small of the back. I absolutely love Garage dresses because they are made of super light fabric, and actually go really nicely with some low top white converse runners. Also, they are affordable, and go on sale a lot, so it is very possible to scoop up $20 dresses every now and then, supplementing the wardrobe without spending a whole bunch of money. The last edition to this wish list post is a pair of Hunter boots, which, unfortunately, I was not able to get a photo of in here (uploading problems . . . .). I know they aren’t exactly flattering, but if you live in a rainy city like I do, then you’ll know that the rainy season extends well into spring, and rain boots are a must-have. And I can attest to this having personally worn such an ensemble on many an occasion, spring dresses do look good with rain boots, at least in some cases. For anyone who has seen Frozen, regardless of whether or not you liked the movie, you have to admit that the snowman Olaf was adorably cute and brought something to the movie. Since the movie came out, I have been obsessed with him, and when it came time for me to make a Christmas wish list, I found the bulk of it was Olaf paraphernalia. 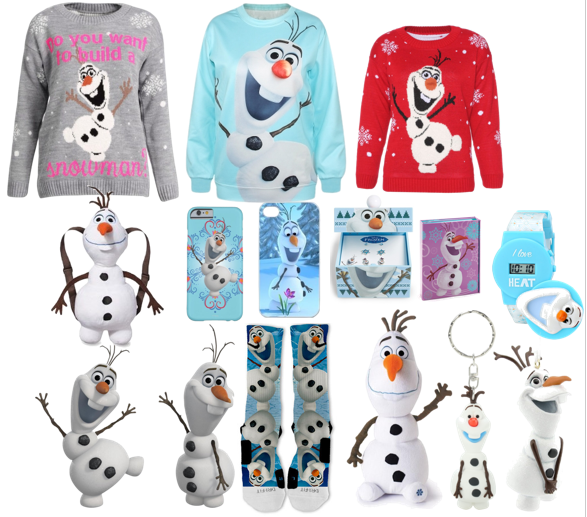 So yes, this collage is just a sampling of the items on my Christmas list, all of which pertained to Olaf in some way. My mother and I have this inside joke where, starting the first of December when we both begin our Christmas shopping, I say, “Hey now, no getting yourself any gifts this year,” before we part ways in the mall and delve into the world that is the onset of the Christmas mad rush. It all started probably 6 or so years ago when my mother arrived home, flung open the front door with bags in both hands and shouted, “I’m home!!! And I got myself some Christmas presents.” Being a devout Christmaser, and by that I mean one who insists that there is a traditional way to do Christmas, I was outraged. How could she?!? Who would take me to the mall now??? What if she shopped for the rest of our family without me??? What if she bought herself what I was planning to get her??? In short, I was devastated. Thou shalt not purchase a gift for thyself with the intention of having it be gifted to thee by another. Thou shalt not purchase a gift for thyself under the pretense that it is to thee and from thee; that is not an appropriate address for a Christmas present tag. Thou shalt not put up a Christmas tree before the first of December, or after December 20th; Christmas deserves careful planning. Thou shalt not have a Christmas tree devoid of coloured lights. Thou shalt not consider desserts with fruit in them to be a finisher for Christmas dinner. Fruit has its own food group for a reason; it doesn’t need to infringe on chocolate’s “alternatives” group. Thou art obligated to put up Christmas lights, both on the interior and exterior of the residence. Thou shalt purchase a Christmas specials TV guide and mark all dates and times of specials in a calendar so that thou shalt not miss a single one. Thou shalt not procrastinate Christmas baking of shortbread and chocolate chip cookies, as Santa Claus deserves the best. Giving Santa Claus store-bought cookies is spelling out for him that he is the spokesperson of a second rate holiday, unworthy of home baked goods..
Thou shalt never give a gift card as a present; so impersonal. Thou shalt never leave the house on Boxing Day and, though permitted, it is seriously frowned upon to change out of pajamas on this day. I was an odd child. That’s really all that needs to be said. So yes, this is my Christmas Confession. Forgive me Father Christmas, for I have violated the second Christmas Commandment, and have already painted my nails with the Bogota Blackberry. They look really nice though Father Christmas, so maybe we can just chalk this up to me being a first-time offender and just say I get off easy this time. Ha, won’t be telling my mother about this though. She’d see it as the a-okay to buy Christmas gifts for herself for the rest of her life. So what are some of your Christmas Commandments and traditions that can’t be broken in your families??? And have you ever bought yourself a Christmas present??? What was it and why??? I have missed blogging, and I am so happy to be back!!! For the past two weeks, I have been in exam season, which basically means that I have been studying all day, and going to work at night since my workplace is going crazy in the Christmas season. Unfortunately, this meant that blogging was put on the back burner while I got through exams, though not intentionally. It just kind of worked out that way when I found the internet so distracting that I cut myself off from it so I could actually focus on studying. With four exams down, and one still to go on the 22nd, I have a few days in between and thought I better get back into the swing of blogging, and what better way to do this than with some beauty tips for when you’re stressed. 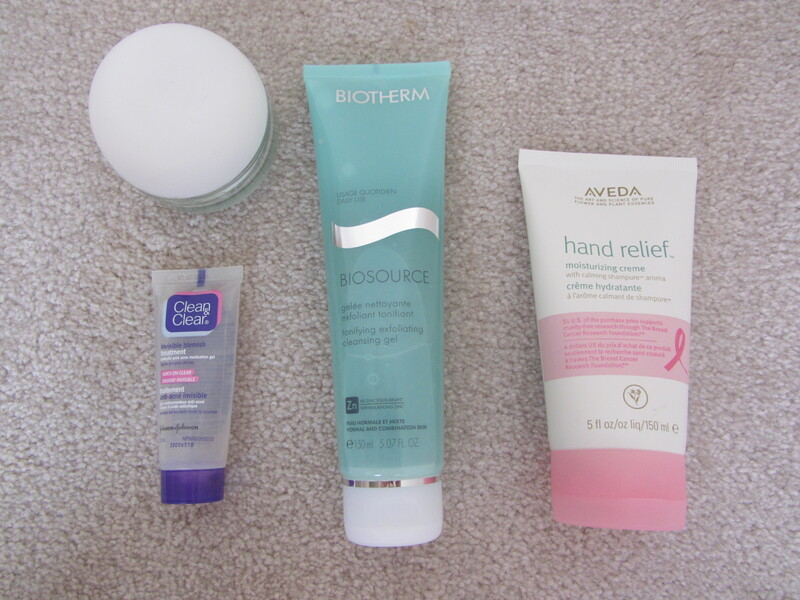 Exam time is very stressful, and sometimes your beauty and skin care regimes can suffer. Because of this, I have compiled a few products that have become part of my exam season arsenal so that my skin remains clean and healthy. 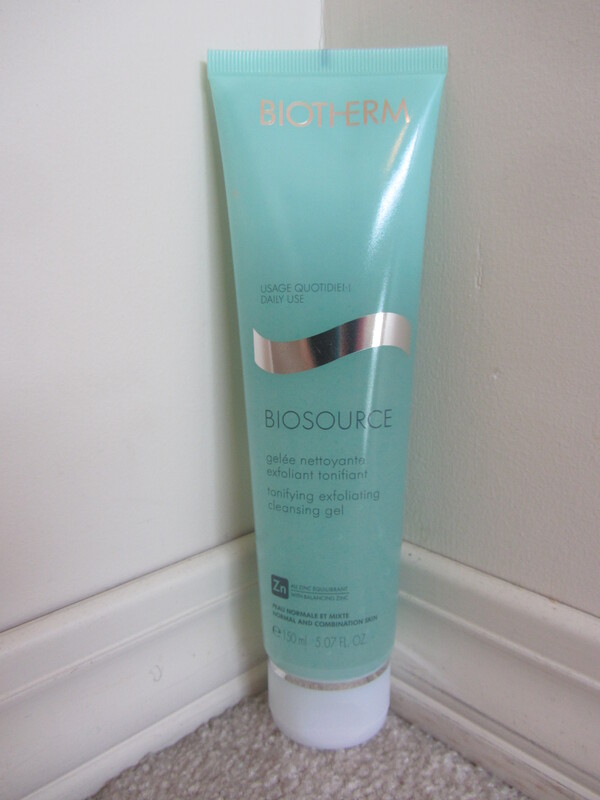 The first product is Biotherm’s Biosource Exfoliating Gel, sold for $20. This is a cleansing gel for normal or combination skin and, if you have extremely sensitive skin like me, then this is a wonderful face wash. It also has very little scent. I have been using it for over three years now, and I have never looked back. It leaves my skin feeling all clean and scrubbed free of oil and dead skin cells, which is essential during exam season when you are stressed and your pores are secreting more oil that usual. 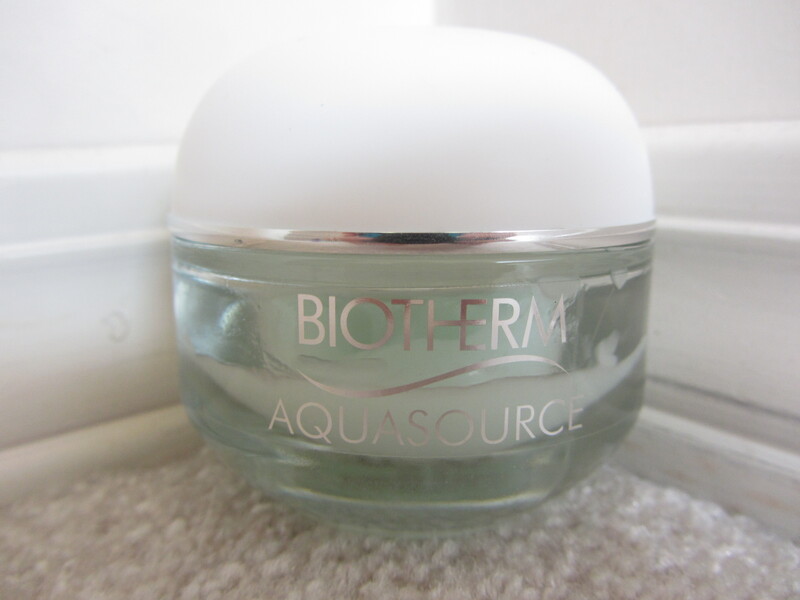 This next product is Biotherm’s Aquasource Deep Hydration Replenishing Gel for normal or combination skin. This moisturizer is quite pricy at $47, but very little is needed per use, so the jar actually lasts quite a long time. 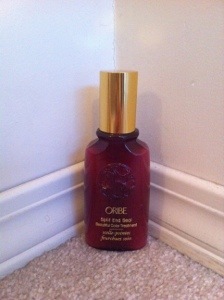 It is the most intensive moisturizer I have ever come across, keeping my skin hydrated for well over a day and a half. Application is quite easy, with 5 small dollops of gel: one on the forehead, one on the nose, one on each cheek, and one on the chin. When blending the gel into skin, it literally feels like it is melting, cooling and hydrating as it goes. In times of stress, my skin gets all out of wack and tends to veer towards the dry side, which is where this little beauty comes in. 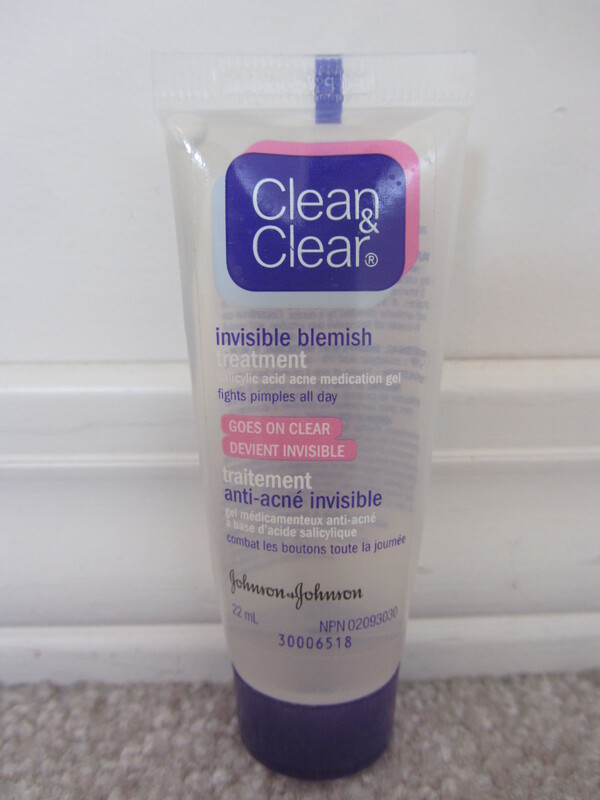 Despite all my efforts to remember to cleanse and moisturize to keep blemish-causing particles off my skin and out of my pores, a few always manage to pop up, which is when I reach for my Clean and Clear Invisible Blemish Treatment. This can be found at any drug store for about $7, but it appears to go on sale quite a bit. It works on normal, oily, or combination skin, and even works well with sensitive skin. I put it on a blemish as soon as I see one coming up and, by the next day, its size and redness is drastically reduced, and by the second day, it is usually gone. I love this product so much that I even keep one in my purse for when I’m out and can’t wait to get home to stop a blemish in its tracks. I would like to note though that this product is not as effective if you have more serious acne beyond the occasional blemish here and there, and it is not meant for blackheads. 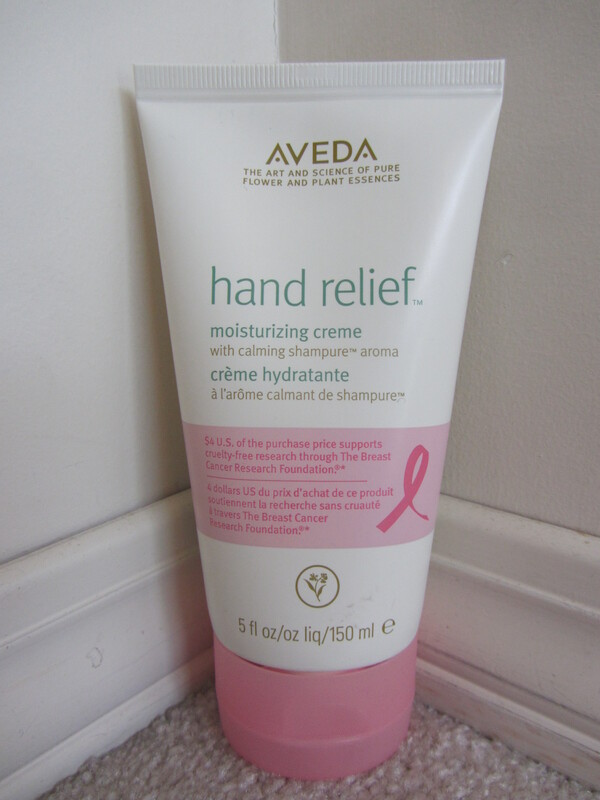 The final product is Aveda’s hand relief moisturizing cream. During exam season, especially for the fall term, my hands dry out from the weather and the stress. With all of the writing notes and index cards and concept maps, you’d think that moisturizing my hands would be easy to remember, but not always. This product is $33, but works wonders on dry hands, and isn’t overly oily, so you can still be writing and studying without your hand slipping on the pen or getting your paper all sticky with cream. Plus, it smells amazing. So this is my little exam season arsenal of the must-have products for stressful times to ensure that the health and cleanliness of my skin does not have to suffer with me during studying. I hope everyone has had a lovely past two weeks, and I am looking forward to getting back into blogging once exam season ends, and I can kick into Christmas gear. Oribe hair products have been used to style the tresses of two November 2014 magazine cover girls: Natalia Vodianova for Vogue and Jennifer Lawrence for Vanity Fair. Since these products are award-winning and notoriously expensive, imagine my surprise when I went to get my hair coloured yesterday and found my hair salon carrying these products!!! My stylist applied it to my hair yesterday, and already my hair feels smoother and healthier than it has in a really long time. And no split ends!!! 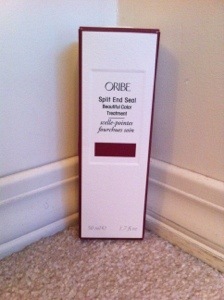 This product should be applied before you blow dry your hair each time. Using two squirts per side of your hair, smear it on your palms, and then, with palms flat, run them down either side of your hair, allowing the seal to coat all of your hair. By applying it in a downward motion, this will allow the seal to fuse split ends back together, as well as strengthen hair strands to prevent future breakage. 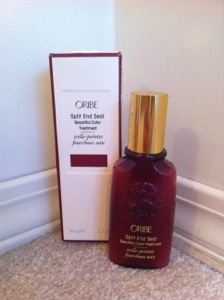 I may not need a bunch of hair products, but this one is being added to my arsenal of hair care essentials!!! Since the fall school term is coming to a close, I am a little behind on my drug store runs for makeup essentials; instead of shopping, I am testing out all the products I have lying around from free gifts with purchase, hoping to make myself look half decent. But after a monster migraine that gnawed on my brain all weekend, I treated myself to a little meander around the cosmetics section of a drug store down the road in the hopes of finding something new to try. 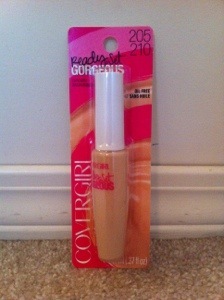 And I found it: Covergirl’s Ready, Set, Gorgeous line, with Katy Perry as the spokesmodel. This line has a foundation, concealer, and powder and promises to be “#instaglam” with its adorable packaging and its claim of full coverage. As someone who has enough Covergirl powder compacts stocked up in her new products drawer to last at least two years after the apocalypse, I figured I would pass on trying out the powder of this new line, but scooped up the foundation and concealer, both on sale for $6.99. 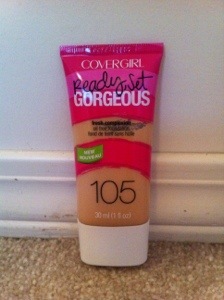 I am always the lightest shade of foundation; never fail. Maybe it’s because I was born in Canada in a city that never sees the Sun until June or so, and even then it rains; or maybe it’s because I spend my entire summers in a thick coat of SPF 60 sunscreen. Either way, I saw no reason to try out other shades to find my “perfect match”: just give me the palest one you got, which was classic ivory 105 for the foundation, and fair for the concealer. I will note here, however, that this line has 12 different shades, all of which seem to be very true to skin tones; none of that sly stuff that looks fine in the package and then you get it home and all of a sudden you look like an oompa loompa. No one wants that. This line, like all Covergirl lines is an oil-free formula so it won’t clog pores, which is perfect for someone like me who has skin that can be best likened to an old curmudgeon. I swear, it’s like a new product touches it and it screams, “Get off my lawn, you whippersnapper!! !” Ok, bit of an exaggeration now that you have the image of a screaming epidermis in your mind, but you get the idea. The foundation went on smoothly, providing full-coverage with only one layer, evening out my skin tone and covering up imperfections like stress blemishes (Curse you stress!!!) It had a smooth texture during application and blended really easily. The foundation left me with a natural look that didn’t oxygenate (go orangey) throughout the day. What I loved most about it is that it didn’t feel too heavy. So many foundations I have tried leave your face feeling like you left a mask on it too long and now it’s hardening into your smile lines and caking to your skin, refusing to let go, but this one was light and fresh. The concealer went on with a little applicator tip, blending really nicely into my skin, hiding the dark circles from lack of sleep that plague any migraine sufferer, and brightening my under-eye area. It would also work great as a blemish cover up. I will note though that it is a thinner formula than the foundation, and appears to be a few shades lighter than its corresponding foundation shade, so be wary of that. I personally love this concealer, and will be buying it again, but I can see how some people might have issues with the thinner formula’s reduced coverage ability. Overall, I love these products and would recommend them to anyone who asked for a light foundation or concealer, but these are more tailored to brightening and evening skin tone than concealing imperfections. I think she was hoping for the more typical shopping list response that goes something like “kind, smart, sweet, and a good sense of humour.” But I just couldn’t give it to her. Yes those things might be important but, at least for me, they go somewhat unspoken. By the end of a first date, I know if someone made me laugh, held the door open for me, watched me eat my food at a glacial pace, and made me feel happy. So when someone asks me this question, I tend to give an outside the box answer, thinking of something that would make a person stand out a little from the rest. 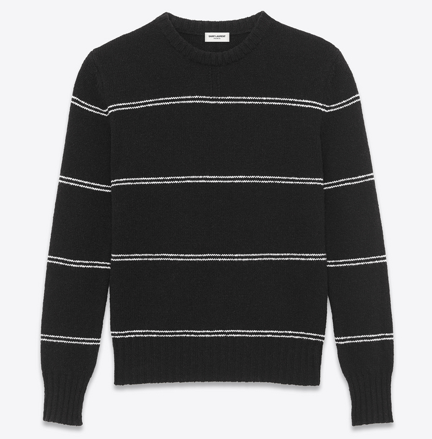 Now this doesn’t mean that the chap wearing the cardigan or sweater has to look like the airbrushed male model who is posing in it on a Ralph Lauren or Yves Saint Laurent website, because yes, then he definitely would stand out. 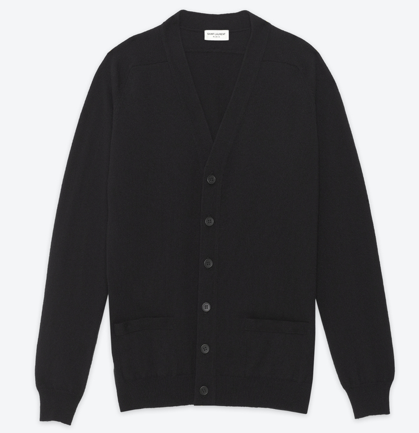 What it means is that I like seeing the odd young fellow choosing a cardigan over the oh-so-typical bulky hoodie and jeans that look like they’re about to fall off ensemble. Also, sweaters and cardigans have been around a long time. While they are made from a variety of materials now, traditionally they were knit, bringing into question when knitting was invented. Because of their delicate nature, few fabric items have survived, but the oldest knit item found is a pair of Egyptian socks that date back to about 1000CE, giving an estimate of when sweaters might have been created. In contrast, the cardigan was named after James Thomas Brudenell, the seventh Earl of Cardigan, who was a military captain at The Charge of the Light Brigade into the Valley of Death. His troops wore knitted military jackets that eventually became known as cardigans. In short, men wearing sweaters and cardigans is nothing new, and it still happens. 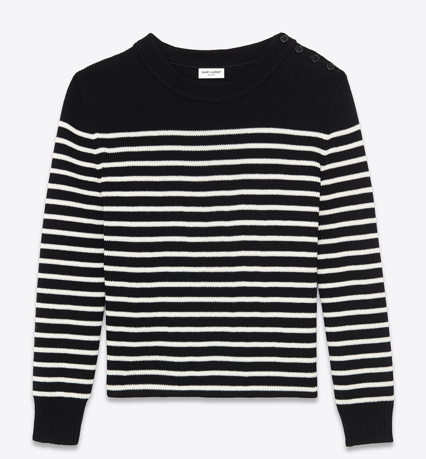 But for some reason, the sweater trend is passed over in adolescent years in favour of a more “hip” look, which is fine, but I still love a good old sweater with a nice coordinated scarf or something; it spices up the outfit a little. 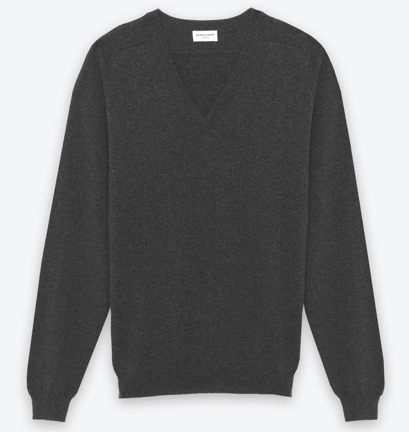 All I am getting at here is that fashion is a mode of self-expression, and I find it hard to believe that almost no young men these days want to rock a good old sweater or cardigan. This is, in part, due to the image-saturated society that we live in, where media teaches us what is “trendy” to wear, and often our preferences are passed over for what is “cool.” But to all the men out there, sweaters and cardigans are a wonderful fashion statement, and there is at least one person out here who would salute you for snatching one up this winter season and rocking it like it’s nobody’s business.